Current (2009) pecan production in Australian is about 3,260 tonnes in-shell or 1,746 tonnes of kernel. There are approximately 1,300 hectares under pecan production in Australia. Pecans are grown in New South Wales from the Hunter Valley through the Mid North Coast and North Coast to the border with Queensland. Australia’s largest producer of pecans is Stahmann Farm Enterprises whose main orchard is at Moree. In Queensland, pecan production is centred on Munduberra, Gatton, Bundaberg, the Atherton Tablelands and Beaudesert. There are a few pecan orchards in West Australia and South Australia. The bulk of Australian pecan production is sold as kernel for domestic consumption, however there are increasing export markets, for example to China which is estimated to account for 10-15% of global pecan consumption in 2009. Pecans constitute less than 5% of world nut trade and their consumption is highly concentrated in North America. The United States is the world’s largest producer of pecans, where they are a native nut. Although exact numbers for world pecan production are not known, it is estimated that the United States produces 75 percent of total world production followed by Mexico with an estimated 20 percent. Pecan production also occurs in countries such as Australia, Israel, South America, including Peru, South Africa and Spain. Close to 90% of all traded pecan nuts originate in the USA and Mexico. The U.S. Department of Agriculture forecast pecan production to hit 309 million pounds in 2009, up nearly 60 percent from 193.9 million pounds in 2008. While cyclical, pecan production in the United States has averaged 252 million pounds per year. In 2003 the United States produced 262 million pounds of pecans with an estimated value of US$263 million. Improved varieties accounted for approximately 78 percent of total production and 86 percent of total value (US Department of Agriculture). 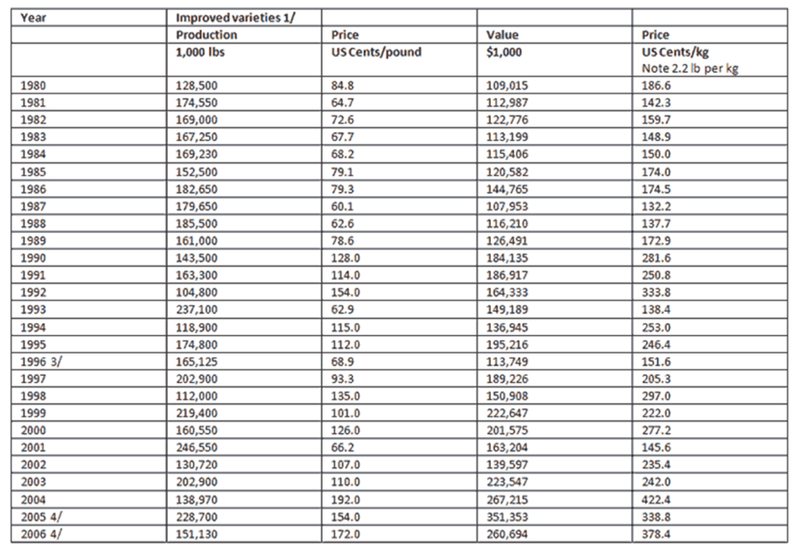 USA Pecan Prices for Nut-in-Shell 1980-2006 for improved varieties only. Source: US Department of Agriculture, Fruit and Tree Nut Situation and Outlook Yearbook, October 2007. 1/ Budded, grafted, or topworked varieties. 2/ Includes Arizona, Kansas, Missouri, and Tennessee in 1989-1992; Arizona, Missouri, and Tennessee in 1993 and 1995; and Arizona, Mississippi, Missouri, and Tennessee in 1994. 3/ Estimates discontinued in 1996 for Missouri and Tennessee. U.S. pecan production is dispersed throughout the South and Southwest. There are 14 states that produce pecans commercially: Alabama, Arizona, Arkansas, California, Florida, Georgia, Kansas, Louisiana, Mississippi, New Mexico, North Carolina, Oklahoma, South Carolina and Texas. Georgia, Texas and New Mexico account for over 75% of production (USDA). Mexico is the second largest world producer of pecans. Mexico’s pecan production comes primarily from improved varieties. The main pecan varieties grown are Western and Wichita, which account for 80 percent of new variety production. A majority of Mexico’s pecan production occurs in the states of Chihuahua, Coahuila, Sonora, Durango and Nuevo Leon. Pecan production for the 2003-2004 production years is estimated at 141 million pounds (US Department of Agriculture). In 2008, the Mexican total crop area planted was estimated at 80,000 hectares, with pecan production up to 90,300 tons. Mexican production is increasing due to improved cultural practices, fertilizer applications, and drip water irrigation systems, and pruning. 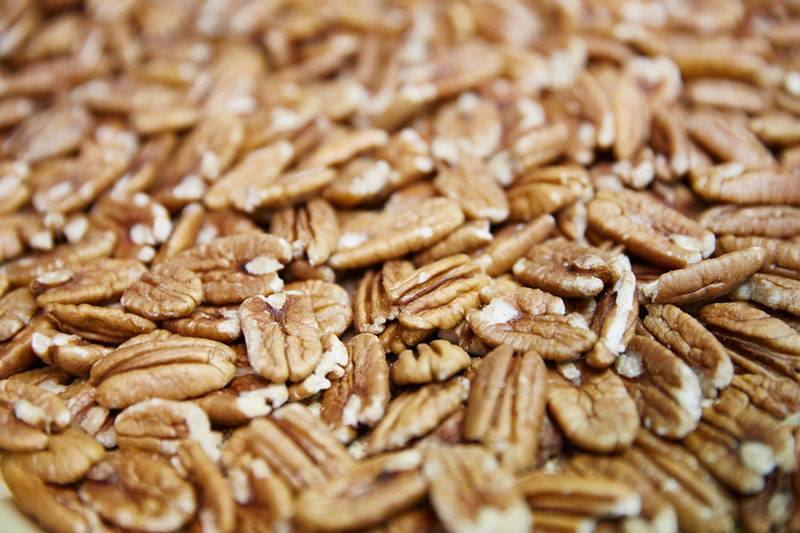 Pecans nuts are good for you … and that’s confirmed by scientific medical research. A handful of pecans everyday can help to reduce your risk of heart disease and diabetes and help manage cholesterol and weight. To find out more about pecans and their nutritional and health benefits visit the Nuts for Life website http://www.nutsforlife.com.au. There you will find recent reports, research, newsletters, fact sheets and nutrient composition tables and you can subscribe to the Nuts for Life newsletter for all the latest research on nutrition and health benefits of all the tree nuts. The Nuts for Life program is owned and directed by the Australian Nut Industry Council http://www.nutindustry.org.au of which APA is a member. Nuts for Life aims to provide useful, accurate and up-to-date information on the nutritional importance of tree nuts in the diet. Tree nuts include almonds, Brazil nuts, cashews, chestnuts, hazelnuts, macadamias, pecans, pine nuts, pistachios and walnuts. The Nuts for Life website contains information for health professionals such as doctors, dieticians, fitness professionals, practice nurses and naturopaths who need the most up to date research, advice and news on the health benefits of nuts when advising clients. The website includes handy information for consumers of nuts – nut recipes, how to store nuts once they are brought home from the shop or market, dietary tips and handy factsheets on the role of nuts in reducing the risk of diabetes, maintaining heart health, managing weight, and general health benefits. To view the latest scientific research on the nuts and health follow the links below.